Oh, dagger to my heart!! 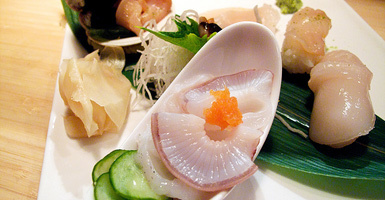 Tasting Table NYC posted an article about a new sushi joint–sniff, sniff. I would sooooo love to sink my teeth on a couple of pieces of tuna sashimi with a smear of wasabi, swimming in soya. And then cleanse my palette with a mouthful of finely shredded daikon. A pregnant gal can dream! If you do go–I don’t want to hear about it!! I mean it! Cravings 101: Me Want Food! Oh my God! That was the worst craving for me when I was pregnant… Sorry… I wish I had words of wisdom. But I don’t. You just suffer through it.